Launched at Baselworld 2017, the Epic X Chrono collection from Jacob & Co. became synonymous with a sportive and active lifestyle. Paying tribute to the lunar rocks and turquoise sea water of the Costa Smeralda, in Sardinia, Italy, the watchmaking brand is proud to announce the launch of a limited Summer Edition. 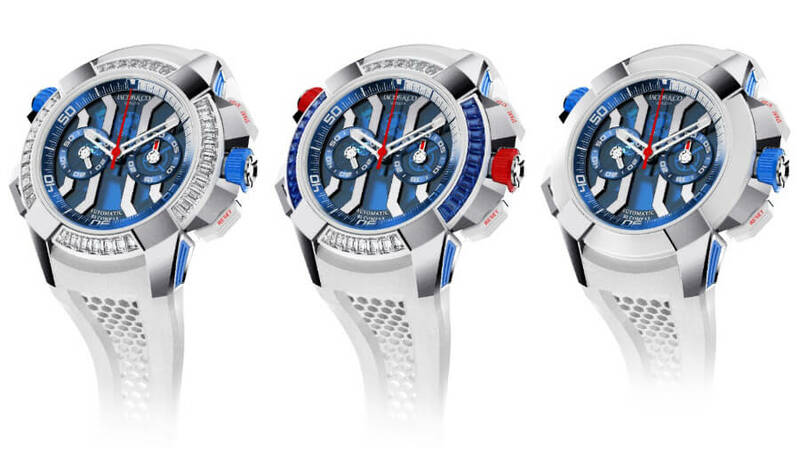 These new timepieces feature a 47mm case and a skeletonized automatic bi-compax chronograph. Boasting a column-wheel, the Epic X Chrono sets itself as a part of the most sophisticated high-end chronograph watches. At the heart of the new Epic X Chrono models lies the Jacob & Co. JCAA05 skeletonized self-winding chronograph movement. 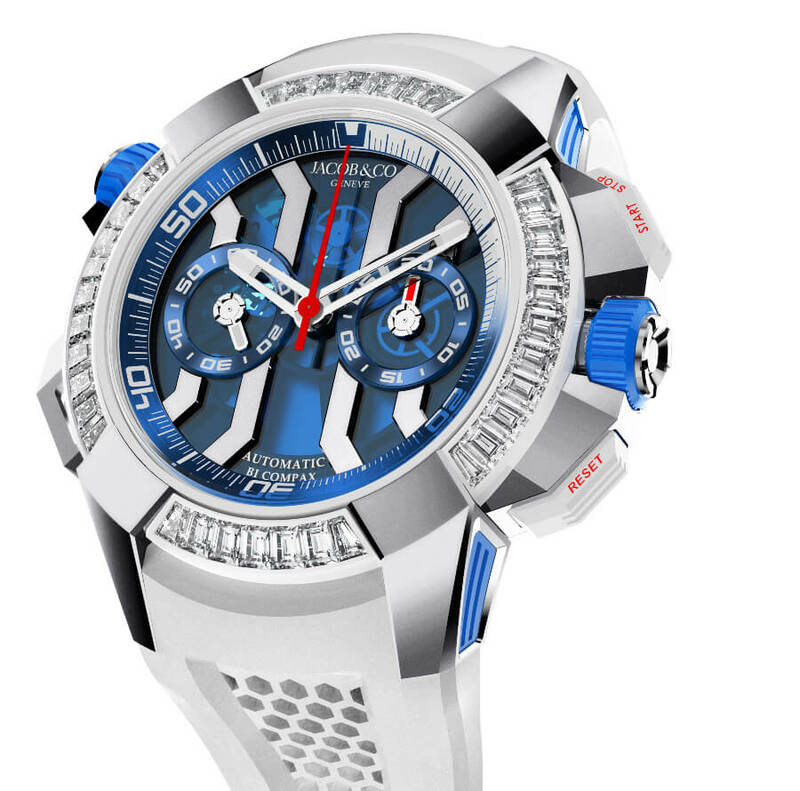 This high-end chronograph caliber is equipped with a column wheel to launch the chronograph functions. Its counters are arranged in the so-called “bi-compax” format, with the small seconds of the running time on the left (at nine o’clock) and the elapsed minutes counter on the right (at three o’clock). The elapsed seconds are read off of the central red chronograph second-hand once the red rubber pusher (at two o’clock) have activated the chronograph. As a practical additional function, the Epic X Chrono was created with a rotating inner bezel that can be controlled by pushing and turning a red rubber crown in the ten o’clock position, which will set a countdown timer. 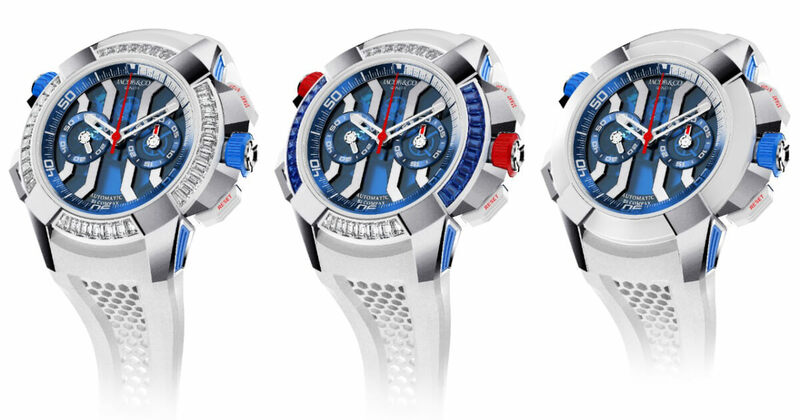 The movement has a self-winding mechanism and a power reserve of 48 hours. Its high-end finish can be admired through a transparent sapphire crystal case back. The models are distinguished by the use of high tech materials. 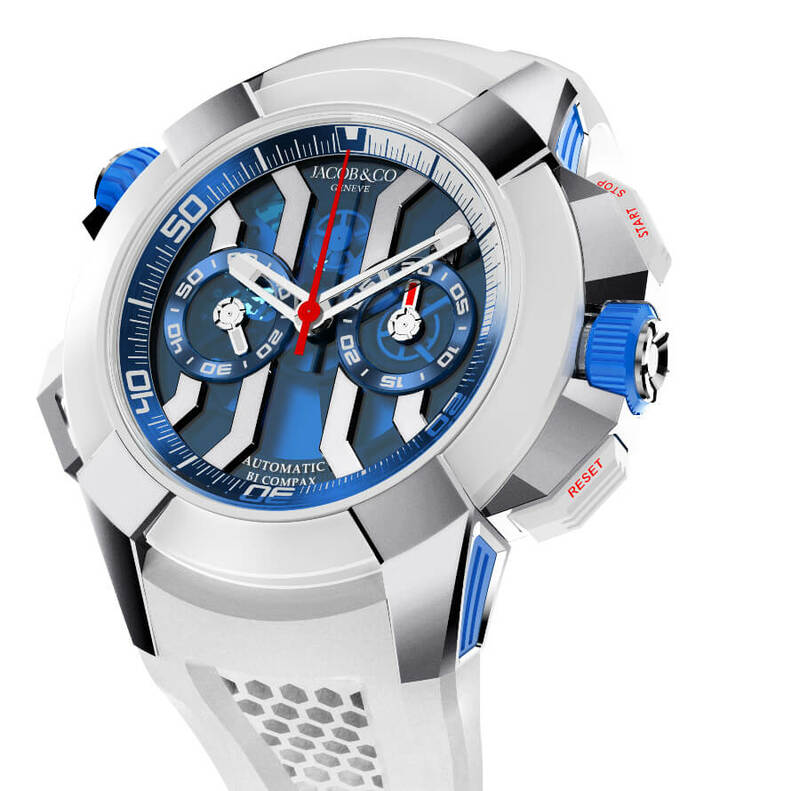 The Epic X Chrono Summer Edition, made in Titanium, has a white ceramic bezel and a blue rotating inner ring. The open-worked movement can be seen through the blue mineral crystal. For a customizable look, there is a range of colors in which the natural rubber with honeycomb pattern straps are available. A screw-down crown ensures water resistance up to 200 meters combined with the rubber elements quali es the Jacob & Co. Chronograph for sport usage. 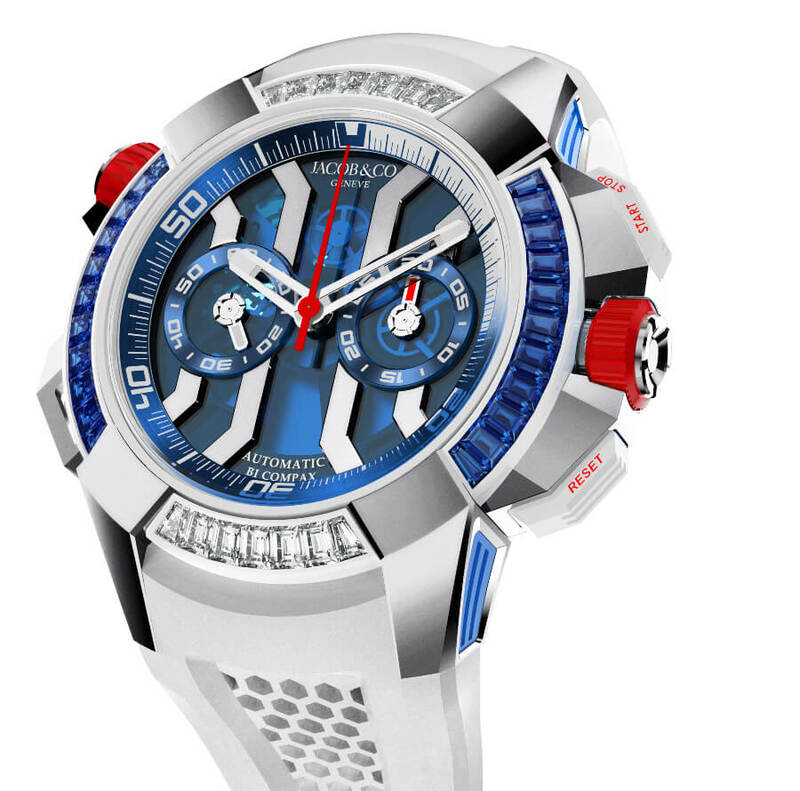 Hands: Skeleton with White SuperLuminova; Red Chronograph Hands. For more information visit Jacob & Co. Online.